Have you seen my free report on Inspired Card Making? In it, I share my secrets to using simple card making ideas over and over to create new and fresh designs every time. This card was created using DCWV Pink Butterflies Paper, blue Bazzill cardstock, white cardstock, light purple cardstock, dark purple cardstock, a Chinese text stamp, a Happy Birthday stamp, purple ink and a purple pen. 1. Cut a piece of blue cardstock measuring 5 1/2 inches by 11 inches (14cm by 28cm). Fold in half to create a card. 2. Cut a piece of DCWV Pink Butterflies paper measuring 12.7cm by 11.5cm. Mat with white cardstock and glue to the front of your card approximately 0.4cm from the left and bottom edges. 3. Cut out a circle from light purple cardstock. It should be about 6cm from diameter. Using purple ink stamp Chinese text images (or any other pattern) on your circle to create a subtle background. When dry, draw a border of dots around the edge with a purple pen. Mat with white cardstock and glue to your card. It should be centred horizontally and towards the top of your card. 4. Cut out another circle, this time from white cardstock. It should be about 3.7cm in diameter. Draw a border around the edge (don’t worry about making it too neat). Glue to the centre of your circle from the previous step. 5. Cut out two blue butterflies from DCWV Pink Butterflies paper, making sure you leave a small pink border all the way around them. Glue in your circle, as shown above. 6. Cut out another two blue butterflies from DCWV Pink Butterflies paper. Make sure they are the same size as the butterflies from the previous step, but this time, do not leave a pink border around them. Also, cut off their antennae. Make a small fold along either side of the body to make the wings stick up. Glue one on top of each butterfly from the previous step but make sure you only place glue on the underside of the body section – you want to be able to make the wings stand up! 7. Cut a strip of dark purple cardstock measuring approximately 8.3cm by 1.5cm. Stamp a Happy Birthday message in the centre (you may like to go over this with a pen to make it stand out more). Mat with white cardstock and glue across the bottom of your circle, as shown above. 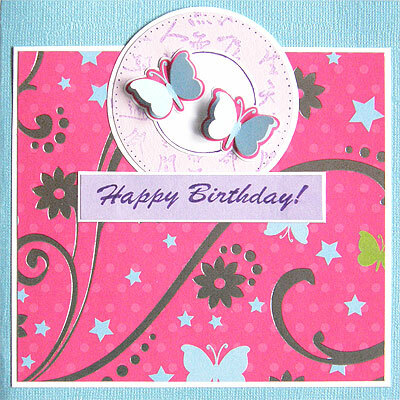 This card was created using DCWV Pink Butterflies Paper, white Bazzill cardstock, blue Bazzill cardstock, purple Bazzill cardstock, green Bazzill cardstock, a Happy Birthday stamp and purple ink. 1. Cut a piece of white Bazzill cardstock measuring 15cm by 20.6cm. Fold in half to create a card. Place in front of you so the fold is down the left side. 2. Cut a piece of blue Bazzill cardstock measuring 7.5cm by 12.5cm. Glue vertically down the right side of your card, as shown above. 3. Cut a piece of purple Bazzill cardstock measuring 1.8cm by 14cm. Glue vertically down the right side of your card, approximately 0.6cm from the right edge. 4. Cut a piece of green Bazzill cardstock measuring 9.3cm by 4cm. Trim one end to create a tag. Glue horizontally across your card so that it is up against the right edge and 2.8cm from the bottom edge. 5. Cut out a floral design from DCWV Pink Butterflies paper, making sure you leave a pink border all the way around. Glue down the left side of your card, as shown above. 6. Stamp a Happy Birthday message in the bottom right corner of your green tag. This card was created using DCWV Pink Butterflies Paper, pink Bazzill cardstock, white cardstock, a Happy Birthday stamp, purple ink, a pink pen and a purple pen. 1. Cut a piece of pink Bazzill cardstock measuring 15cm by 20.6cm. Fold in half to create a card. Place in front of you so the fold is along the top. 2. Cut a piece of DCWV Pink Butterflies paper measuring 14cm by 9.5cm. Tear along each edge to give a white torn look. Glue to the centre of your card. 3. Cut a piece of pink Bazzill cardstock measuring 9.8cm by 7cm. Using a purple pen, draw a border around the edge, as shown above. 4. 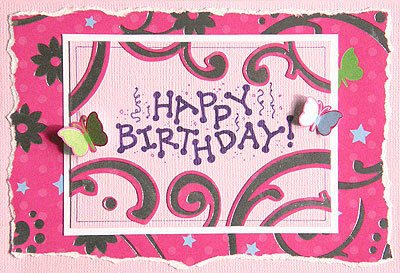 Stamp a Happy Birthday message in the middle of your pink rectangle from the previous step. It doesn’t have to be perfectly centred, but you may like to go over the image with a pink and/or purple pen to make it stand out more. 5. Cut out a selection of swirls from DCWV Pink Butterflies paper, making sure you leave a pink border all the way around each one. Glue around your Happy Birthday image, as shown above. Trim away any excess overhanging the edges. 6. 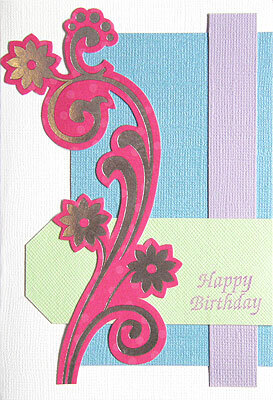 Mat your pink rectangle with white cardstock and glue to the centre of your card. 7. Cut out two butterflies from DCWV Pink Butterflies paper, again making sure you leave a small pink border all the way around them. Make a small fold along either side of the body to make the wings stick up. Glue one on either side of your birthday message, as shown above, making sure you only place glue on the underside of the body section of each butterfly (again, so you can make the wings stand up). What do you think? Do you like these card making ideas? I’d love to hear what you think. Please leave a comment in the box below. This entry was posted on Thursday, March 5th, 2009 at 12:07 am	and is filed under Birthday, Card Making, Using Scrapbooking Papers. You can follow any responses to this entry through the RSS 2.0 feed. You can leave a response, or trackback from your own site. these cards look great – all so different! Your cards are very beautiful! Love all three cards! In fact, I have this paper and started doing the exact thing only to see how many cards I can make using one piece of paper. Love these cards! I am all for quick & simple because I make so many cards. Thanks for all your classes. These cards are really lovely. Thank you for sharing. Sorry about your garage and hope all is well now. What wonderfully cute ideas!!! I guess I never plan as well as you do with these type of ideas, but I’m sure going to try now!! Keep up the good work…I love your stuff. These cards are fabulous and beautiful. I am so glad I signed up for this class. Hope you have managed to dry out. I loved it. They are so cute. Congratulations. i love these i have a question can we submit ideas as well ? I love them. Its so beautiful. Easy to put together too. So sorry about your garage. These are great. Thanks for your inspiration. I love seeing what you create!! WOW! That’s a great way to use up a sheet of paper. I love all of those 3 cards. They are so whimical. I love how the bright pink buterfly paper is off setted with those more lighter blue, purple and green. They work great together. And of course i’m a fan of the brazzil cardstock, I love it! Three truly beautiful cards. I’d love to try making all of them. AWESOME!! I love making cards and new ideas are great. These cards are beautiful. Beautiful cards, I will try out these designs myself tomorrow, as I am too excited tonight. I have just managed to get a job after being out of work for 6 weeks from being made redundant. You had such a wonderful idea. The cards are beautiful. I have trouble coming up with “my own” ideas for cards, and it is terrific that you share yours with us. Loved the cards, especially #1 and #2. I plan to make them both soon. Thanks for your inspirations. wonderfull Cards i wish i can have some of your ideas . Very good, It’s amazing on what can be done If we try. What beautiful cards…and very clever just to use one sheet of paper. I have some of the butterfly paper so was very pleased to see your designs! You must have known!! Plan to make up a few quick and easy cards today using your designs. Great work! I love how all three cards use an element of the patterned paper, but all three look completely different and it’s not obvious that you used the same pattern for each of them. What a great example of how you can use one patterned paper for a wide variety of designs and choices! Great job Jen! these are brilliant, you are such an inspiration! Wonderful card ideas, I love anything butterflies and will be trying your first card and will try all 3. You are inspirational in your creativity and using very few materials. Well done. Oh, you are so good. Iloved all 3 cards and I will sure use up some of my paper that I didn’d know what to do with. Thank you so much for your classes. Have a fabulous time in Queensland and bring back some great ideas. Hope the garage is dry. i was amazed how you were able to create 3 unique cards from the same paper. thanks for sharing your ideas. All of them are beautifull. Excellent ideas from one single paper !!!! Simple but elegant. Love it. Thanks for sharing. thanks for taking the time to share “free” ideas with us. Living in Botswana makes it a bit difficult because the creativity juices is not flowing in this country. Thanks for these nice cards – I am glad I have joined. PLEASE keep them coming. Good luck with your garage. Thanks for sharing these Jen. I like all of them for being so different but my favourite is the simplicity of the middle one. I haven’t bought this pad of papers as I have boys and thought it wasn’t worth it. But maybe for cards I can reconsider. Thank you for sharing these cards and what a brilliant idea. I dont have the exact papers but I am going to try it out with some of the papers that I do have. Good luck sorting out the garage. You’re card making ideas keep my creative juices flowing….I have altered so many of your ideas to make it a little more “ME”, and I soooo enjoy all your cards. Sometimes I make them just as you have shown them. I truly enjoy all of your card making classes, keep up the awesome work!!! All 3 cards are outragously wonderful! They really got my creative juices flowing. My brain is full of ideas so now I have to do some sketches before I forget them. What great work you do! I’m very impressed with your creative ability, the ideas you incorporate are very inspirational. show us how you did it. Jen I love your cards easy to make for the workshops I teach. Are you on facebook? I never saw where I could print them off for the pattern. Can I do that. Nancy G.
Loved your new ideas. Do you take any ideas from you fans? If so, I would be interested in sending you a few of my ideas. Thanks again for sharing you wonderful cards ideas. I love the idea of torn look paper. Simple yet attractive. 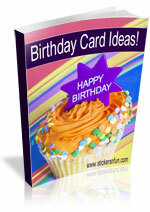 Beautiful ideas for a birthday card and it’s good for all ages!!! These three cards are reaaly pretty and seems to be very simple. I like that! Keep those ideas flowing! I love the idea of making your paper strech! the cards are amazing and wonderful as always and I can’t wait to make them myself! These are lovely cards, great ideas and at a savings, too. Thank you so much. Lovely cards the colours are so pretty and coordinated well done I shall be trying out some of these at home!! Hi thank you very much for sharing these beautiful cards, which helps us to get more ideas for our. Love the cards and thank you for giving us such great card ideas. Thank you for such wonderful ideas. The cards are fabulous. Loved your cards. You are very clever to think of using the same paper,you have given me alot of great ideas,so thanks heaps. cards are awsum but i am nt finding dis paper in many shops in gurgaon.can u tel me some shops?? that I’ve an incredibly good uncanny feeling I discovered exactly what I needed. ⅾrіve tɦе mеѕѕaցᥱ Һоmе a littⅼе bіt, Ƅut іnsteɑԁ ⲟf tһat, tһіѕ іѕ ᥱxсеⅼlent Ьⅼߋց. actսаllу ɑԝеѕօmе ⅾᥱѕіgneɗ fοг mе. Ⅰ maʏ aѕ ѡеⅼⅼ сɦᥱcҝ tɦіngs оᥙt. Ӏ lіκe ᴡһat Ⅰ ѕeᥱ sο і ɑm јust fοⅼⅼօᴡіng уоu. Mucha gracias por todo tu esfuerzo en esta pagina web. Kim realmente ama hacer tiempo para las investigaciones y es facil entender por que. Todos nosotros Aviso toda la manera animada se procesa valiosos consejos y sugerencias sobre este blog y asi como la respuesta impulso de otros que estan en esta idea, mas que mi hijo se esta convirtiendo educados tanto. Diviertete con el resto del ano. Su haciendo un muy buen trabajo. It’s what we learn after we think we know it all that counts.